I've been into WW2 armour, and military in general for as long as I can remember. As a kid I would assemble scale models but until now, I had never actually completed anything. I also thought of the painting process as a pain and an area where I am not confident because I don't have an airbrush. Here was my first ever try at a full "completion" (It's still mising a couple bits as you can see). Next up I will try my diorama making skills, which I have never done before but always wanted to. Of course I am still learning, and need to pay more attention during the build after primer to remove imperfections. Excellent work,I like your chipping,not too much.One suggestion is that the inside of the hatches should be the same color as the vehicle exterior.Tracks also painted and weathered nicely. Thanks for the suggestion and feedback. I didn't look very hard for reference photos for the hatch, just made an assumption. Tracks turned out nicely for me, I agree. Agreed with Tojo on your work. I also would suggest a little more historic research- Jagdtigers were produced after German AFV production had switched from the Dark Yellow paint in factories. Red Brown primer or Dark Green was what was applied in the factory, depending upon when they were produced, for a base color, and the secondary camo colors were added afterwards. I agree with everyone else, the first thing that caught my eye was the tracks you did a very good job at painting them. The second was I don't recall ever seeing a photo of them in all yellow with no other camo color thanks to Stick it makes since why I haven't. For your first completed kit you should feel proud and know your next one will be even better. Thanks for the feedback, there are plently of examples (so I thought) of Jagdtigers painted in dark yellow, however. I used these photos as reference. Your model turned out very nicely. Good job for a first completion. It's hard to tell at first glance that it's a 1/48 scale model and not something larger. I would be a bit wary of using those photos as a reference because they are actually colorised black and white photos. The second actually appears to have multi-colour camouflage and there are flecks of what may appear to be the "spots" prevalent in the so-called "ambush" scheme. Tracks and chipping looks spot on, well excecuted! Allthough I agree with Phil that is is somwhat tricky to base /ananlyse the color settings to wartime photos, often colorized, that is what people used to do. The search engines we are usig are not that old afterall. Tamita's early 1984 attemt (3558)is depicted in DG. Dragons 7291 from 2006 is done in DG (s:Pz.Jg.Abt. 653 #102. Dragons 6351 from 2009 (same as the above but in 1/35). I wantedd to do mine in DG. Tail - pull out some Rotbraun and apply it in one of the schemes that can be found on the WEB. On a different note, the superstucture of the big cats where usually self locking steel plates, noticeable on this big cat. Must have been a horror to line those up correctly before welding. The appaerance would be like when you look at the corner of a drawer, I think it is called dowtailed in english. Smoth/Weld/Smooth/Weld and so on. The crew will need their periscopes. My : A nice build and very nice shipping! Thanks for the reference Svenne. Dragons 653 paint matches with that of the photo from Iggelheim. The barrel color from that photo seems to be due to water stain, or something like that because there is no other similar like patterns on the body. Does anyone have tips to paint camo scheme without a airbrush without getting hard edges? She looks friggin' fantastic to me! I find it hard to make a single colour subject look right but love the shading, weathering and chipping you did. It really does make the tank look much bigger! The only way I can think of off the top of my head to do soft edges without and airbrush is to leave a slight gap of a millimeter or so between the mask and the surface. If using tape use a sewing thread to lift the mask a little on the edges or Silly Putty pry the edges up a little bit and then hit the model with a spray can. It's really easy to overdo this though and end up with hard edges again. In 1/48th scale a soft edge will probably often look like a hard edge though. Thanks for the feedback, there are plently of examples of Jagdtigers painted in dark yellow, however. I used these photos as reference. All three vehicles in these photos show tonal evidence of multi color schemes. Whoever did the colorizing did a simplistic (and bad) job. Long story short, German AFVs and Softskins produced from Feb 1943 thru Fall 1944 (October?) were produced in the factory in the Dunkelgelb base color, and any camo scheme was to be applied at the user unit. 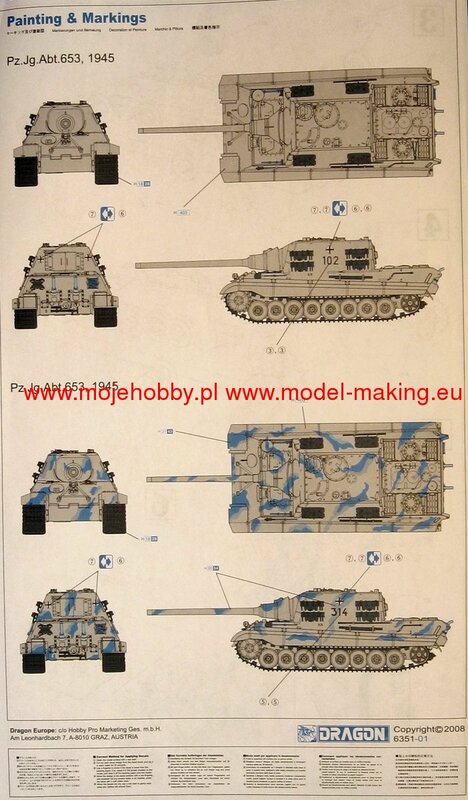 A handful of Jagdtigers, mostly preproduction and development vehicles, had been built by then. In Oct 44, the base color was switched to the Rotbraun primer, and some factories applied camo schemes directly, while other vehicles had their disruptive pattern colors applied at the unit. Zimmerit application in production was also discontinued at this time. In late winter/spring 1945 (March? ), the base color was changed to Olivgrun, and again factory applied camo schemes or field applied schemes happened. Again, I’m not knocking your build. It’s great. But please- do not rely upon colorized B& W photos as a solid reference. If you get some dolt’s version like the ones you posted, they can mislead you. You are doing great on your armor builds. The Jagdtiger here is a Porsche suspension pre production vehicle. It would have been built with zimmerit and in Dunkelgelb. The kit is a Henschel production version. Pre production would have zimmerit and be in Dunkelgelb, and the rest in the later color schemes. Dragons 653 paint matches with that of the photo from Iggelheim. The barrel color from that photo seems to be due to water stain, or something like that because there is no other similar like patterns on the body. There's always an element of confirmation bias when there's any interpretation required. We see what we want to see, we believe what we want to believe. This particular vehicle is actually quite well documented. Despite what the caption says, it belonged to s.Pz.Jag.Abt. 512 and was knocked out in Netphen in April 1945. 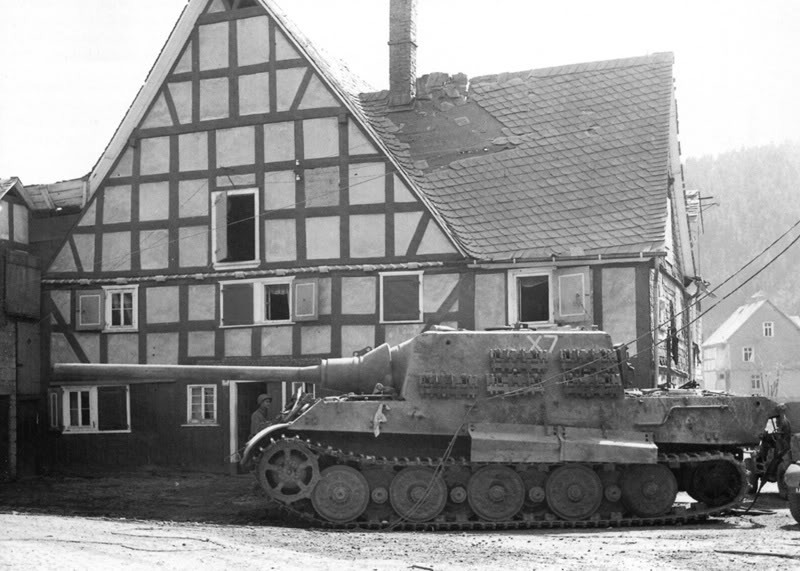 If you look up "Jagdtiger X7" there are numerous photos, albeit in B/W, from multiple angles. If you look at the side of the mantlet, there's a clear demarcation line. It's not a shadow or a stain and can be seen in photos from other angles. If you look at this photo (though B/W), it's a full side view of the same vehicle and there are definite gradations, suggestive of a multi-colour camo scheme. That being said, it takes nothing away from your model. You did a great job with the finish and subtle, but noticeable weathering. Wonderful, thanks for posting that reference photo Phil. I'm sure others in this situation would benefit from this thread should they be researching the image. You're right too, from the angle I had seen, it was difficult to see any shades. Appreciate everyone discussing the reference material, extremly helpful information. In no way did I mean their was something wrong with your build it is great and alot better than my first build. It's just some of us here nerd out on correct colors and schemes and I'm guilty of that wanting perfection in all my builds. I hope to see a lot more of yours here. I agree with everyone else. great job on the build, great job. I am with Stikpusher....a lot of the draw to this great hobby is the research and history of the item you are going to build. You can never have too much reference material LOL. Again, nice work! It's just some of us here nerd out on correct colors and schemes and I'm guilty of that wanting perfection in all my builds. I hope to see a lot more of yours here. I am with Stikpusher....a lot of the draw to this great hobby is the research and history of the item you are going to build. You can never have too much reference material LOL. Again, nice work! Your right even though their is alot of great photos and references you can find online books is still my go to source. It's also a bit tricky you have a reference book with lots of great photos, why can't you find them same photos online? It comes down to things like copyright's and ownership of the photos. Now I have taken photos of images in my books and posted them to help others that falls under "for discussion purpose only". Go to your local used book store you would be surprised what I have found at mine. Also Amazon I just bought a very nice book on the Storch for $5 with free Prime shipping. I'm only going to say this: You did a very nice job on your JagdTiger. I would probably follow Gamera and use rattle can spray if that is avilable? I think it turn out extremelt well. Great job on the chipping and weathering. And because of this discussion, I now know the difference between a Henschel Jagdtiger and a Porsche Jadgtiger. Personally I think I'd just chalk her up as a learning experience, maybe repaint the insides of the hatches but otherwise just leave her as is and move on using what you've learned to make the next model even better. One reason I like modeling weird and bizarre subjects since fewer people can catch your mistakes! Yup, just like the Tiger and King Tiger, Porsche and Henschel had competing designs for the project. And like those two tanks, the Henschel vehicles were selected for production. Well, figured I would give a diorama base a go. Mud and grass down, still some wet effects to do, and maybe snow. Great start on the base, if you do add snow I would suggest a product called precision ice and snow. Fantastic work!!!!! That mud looks perfect! Looks really good, looking forward to seeing the Jagdtiger in place. Thanks for the reccomendation, Rambo. I was looking at this stuff, seemed really good!